The simplest, most effective personal money management tool you'll find online. And it's free! Savey.co is a RC until September 2015. A release candidate (RC) is a beta version with potential to be a final product, which is ready to release unless significant bugs emerge. Financial education is what separates the people who know how much money they have from the ones who don’t know, this stage should be learned and explained to younger generations. People are always looking to be more efficient, through better technologies and smarter solutions, however, one should understand that by simply acknowledging the way your money flows out of your wallet, could ultimately help you save your budget. Asociatia Events NGO, the creator of Savey.co, has it's office in Cluj-Napoca, Campului 141/3, Romania, and is registred with "Certificat de inscriere a persoanei juridice fara scop patrimonial nr. 42/23.02.2011", CIF 28070537/22.02.2011. Bank details: RO76 ROIN 9209 0010 3179 RO02, Romanian International Bank. Asociatia Events is committed to furthering the development of this app and enabling volunteers to easily contribute to that work. Want to help? Send us your info at support@savey.co. 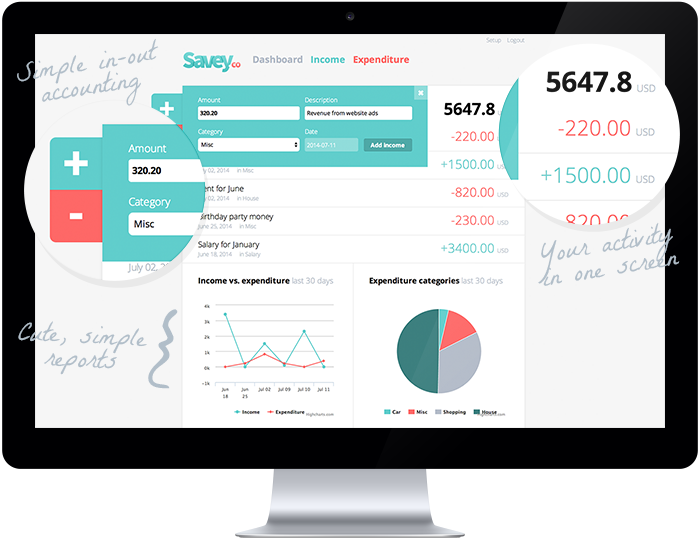 In order to “play” with your data anyway you want Savey will soon include advanced reports, account regularisation and an export feature enabling you to compute unlimited appraisals just the way you want. With a crystal clear view of your cash flow you'll be able to perceive a pattern that will set a trend into saving your buget and optimizing your expenses in ways you didn’t imagine Spend and save to realise your own financial goals. Making money management easy. Once you start using your account you’ll love the multiple accounts feature mainly because if you have separate types of incomes/expenditures keeping track of all your data will be “easy money”. Account includ: piggy bank, wallet, current account (including multiple currencies), deposits, loans, etc. Just login with your Facebook or Twitter account (or create a new account via email) and within seconds you will start Saveying your money.